Before getting into it, I just want to make it clear that I do not believe Andrew Lawton had any malicious intent when he referred to Trig as being afflicted, nor do I think he dislikes, hates, or intends to vilify people with disabilities. Without putting words into his mouth, based on our conversation yesterday it is my understanding that the use of the term ‘afflicted’ was a combination of simply using a common part of speech and a fundamental belief that the disabled do encounter limitations and, therefore, the term ‘afflicted’ is appropriate. Without sounding too much like a high school essay, to understand the problem with deploying “affliction,” we need to look at the literal definition of the term. Merriam-Webster (among others) defines ‘afflict’ as meaning “to cause pain or suffering to (someone or something)”. To call a disability an “affliction” then is rooted in perceptions of pain, suffering, injury and trouble. All of these words rely on a common myth of disability — that all who are disabled are sick, in pain, or suffering. 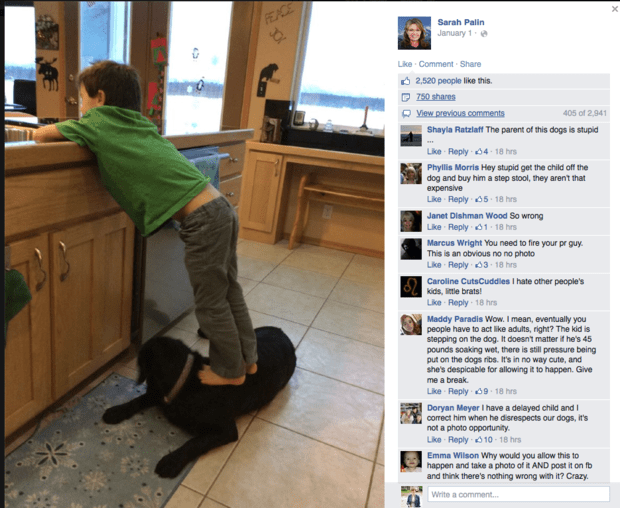 The idea of suffering at the hands of Down syndrome runs contrary to what we know about Trig and the positive ways Sarah Palin, herself, views her son. Is Trig “in pain” or “suffering”? From all reports, no, he is not. Digging deeper into the etymological roots of the term afflicted, we find heavy overtones of the Judeo-Christian tradition. As Merriam-Webster goes on to explain, the word comes from the latin term “affictus,” meaning to cast or strike down. This aligns with the common Old Testament trope that disability is a mark of sin, a stigma cast upon those who dare transgress God’s law. As Deborah Creamer explores in her text Disability and Christian Theology (2010), the Old Testament is teeming with examples of disability being used as a punishment, with sinners bodies ritualistically polluted and scorned. In this way, disability is seen as a curse and the disabled themselves are embodiments of evil transgressors. 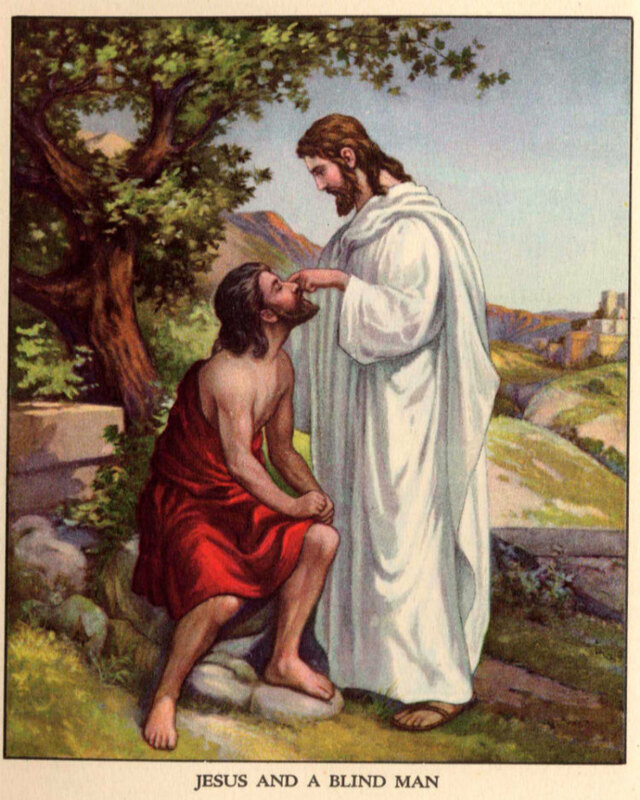 Creamer explains that the New Testament would change this interrogation of disability, with the disabled becoming the objects of pity and charity as Christians follow in the path of Christ the Healer. Regardless of your religious, ethical or moral belief system, it’s safe to say most do not believe the disabled to be evil or enduring the punishment of a vengeful God and most disabled people, including those with Down syndrome, would not describe their experience as exclusively “painful” or “suffering” (noting, of course, that the terms ‘difficult’ or ‘limited’ are very different than suffering). Therefore, the term ‘afflicted’ is not appropriate because it doesn’t represent reality. Linguistics and history aside, the term ‘afflicted’ carries with it some interpretive weight that constructs a very specific frame around how we interpret and understand disability. Of course, this negativity is not rooted in the lived experience of the disabled but through the imagined experience of disability by the nondisabled, the normate, who cling desperately to their perceived bodily wholeness, convinced that to lose an ability would be to lose their entire existence. Disability becomes conflated with the fear of loss, and the inability to walk becoming equivalent to the worst tragedy imaginable. But if you lose the ability to walk, would that be so bad? As I explained on the radio, losing the ability to walk is only bad because of the ableist nature of our community, and the inaccessibility that results, and not in-and-of itself. In fact, I would argue that in a world that is fully wheelchair accessible, walking would become the detrimental form of transportation — it is slower, takes more effort, is harder on your body, and wears out your shoes. Looking at it from this perspective, Trig’s real affliction is not Down syndrome, but the fact he was born into this ableist culture. These negative normate frames of disability are more than just casual descriptions — they form the way people see us and we see ourselves. 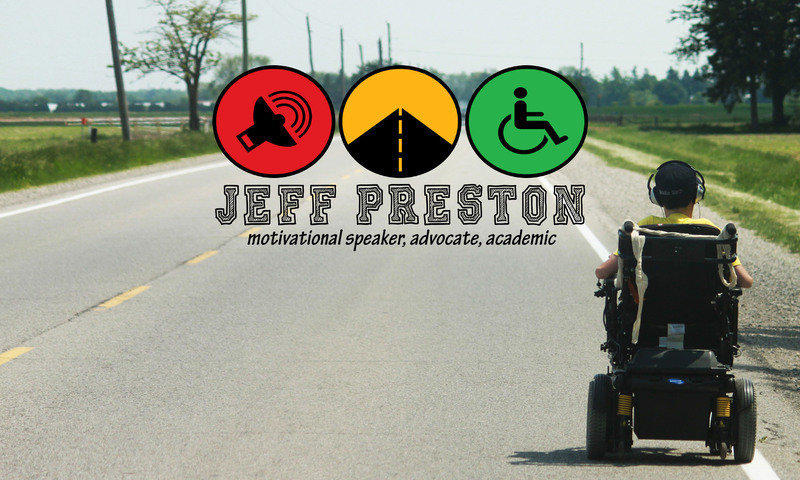 On the radio show, I asked viewers to imagine if they themselves were Trig and what impact it would have hearing day in and day out how hard it is to be disabled, how sorry people feel for you, and that your disability is an affliction. One would hope that personal experience would help to fight back this ignorance, but speaking from first hand experience it is really hard to not buy into the hype. If everyone is telling me that my life is harder or worse than everyone else, how can I not become a little bitter? When all the words used to describe disability are rooted in negativity, how can we imagine any other world? This negativity does not reflect my experience of disability, nor the experiences of many other disabled individuals I’ve met and/or read, and it is an injustice for the nondisabled to dictate how we view our lives, experiences, and worth in this world. The Facebook post that began the controversy. A question that Mr. Lawton asked repeatedly yesterday that I feel I didn’t answer quite clearly is whether or not the term ‘afflicted’ is truly offensive or if this was just nitpicking or gotcha activism. While ‘offensive’ is perhaps a bit too harsh, the usage of ‘afflicted’ in this case is certainly incorrect, etymologically and philosophically. Use of the term, regardless of intention, condones and reinforces the normate imagination that the disabled are suffering and deserve our pity. Using the term ‘afflicted’ situates the problem of disability internally, making Down syndrome the root problem not the construction and imagination of society itself. Therefore, this does not bring pressure to bear on dominant ableist culture nor does it lead to the emancipation of the disabled, writ large. Further, I question why Trig’s disability was relevant to the news story at all — why did we need to know Trig has Down syndrome in a story about animal cruelty? Why was he not defined by his hair colour or height? Why was Sarah Palin not defined as a caucasian woman? None of these details were used in the story headline because none of these descriptors were relevant to a story about Palin taking a photo of her son standing on a dog. For all of these reasons, I don’t think it is just nitpicking. The reason this is important is because the mass media plays a role in both informing and framing the world around us. More than just a source of information, though, the mass media helps form the ways we speak and think. Obviously viewers have agency and can decide how they feel about the content of the story, but the phrases used by the media are often validated as the ‘appropriate’ way of speaking — the mass media both mirrors and informs our lexicon, popularizing certain phrases (and therefore ideas) through repetition. In this way, the media offers us an opportunity to begin making wholesale change to the way we think about and talk about disability. One simple way is for journalists to stop relying on these old disability tropes (afflicted, confined by, stricken with, suffering from, etc) in an attempt to stir emotional responses from their readers. All of these tropes are really just reflective of the journalists own opinion of disability, not necessarily a statement of fact, and therefore along the code of media ethics and objectivity, should be avoided. In this story, specifically, I would recommend simply defining the subject by the most apt descriptor that is relevant to the story — the fact that Trig is Sarah Palin’s son. If a journalist were doing a story specifically about Trig’s disability, for whatever reason, I would recommend simply stating it as it is — Trig has Down syndrome. This does not force an opinion or stance on the disability or diagnosis, but simply is a statement of fact and, therefore, is an equitable way of disclosing his disability. Very interesting. Disabilities in Sarasota, Florida. Stumbled upon your blog and loving the articles. You’re a great writer and a true advocate for people suffering from disabilities everywhere. Keep it up!